Whale watching is a growing industry that is making Tonga a top destination for whale-watchers annually. But a lot more needs to be done so that locals can benefit more while whales also need to be protected so that they can continue to keep coming back to our waters. Two respected personnel in the tourism and whale watching industry made the comments while speaking at the 'Whales in a Changing Ocean' conference at the Tanoa Dateline International Hotel Tonga. Former Tonga Tourism Director Semisi Taumoepeau and Erich Hoyt, Research Fellow (Whale and Dolphin Conservation Programme Lead, Critical Habitat and Marine Protected Areas Co-chair, IUCN SSC-WCPA Marine Mammal Protected Areas Task Force) made presentations at the conference. Mr Taumoepeau, the Director of Pasifika Relations at the Auckland Institutes of Studies, presented two reports on a research carried out by the Institute in Vava'u, focusing on whale-watching operators and workers. "We carried the survey and research out in Vava'u with Tongan based questions, interviewing both operators and workers," Mr Taumoepeau said. "The fact is the industry is growing and growing but the question many locals are asking is what is in there for them. "Some workers do not even understand what whales are and little knowledge about what they are supposed to be doing." Mr Taumoepeau said the local benefit is minimal at the moment, with a major chunk of the income and revenue generated being sent away overseas because most of the whale watching businesses on Vava'u are foreign owned. He said the fact that humpback whales breed in Vava'u more than anywhere else in the region is something that Tonga can use to full advantage. "But our local staff need to be trained, our operators need to have funding assistance and we are hopeful that Government will be able to look at those needs and help them," he added. Mr Taumoepeau added that despite been identified as the "lifeblood" to the economy yet the industry still suffers with the apparent lack of appropriately qualified personnel at all levels, in key tourism disciplines such as tour guiding and whale watch guides, digital marketing, planning and in most supervisory and managerial levels. In his presentation on The Global Status and True Value of Whale Watching, Mr Hoyt said the challenge is to ensure that whales are protected so that people can still benefit from them also. "We have to make sure that whales are protected from harm and danger so that they can keep coming back," he said. Mr Hoyt pointed to the fact that more and more tour operators now are marketing 'whale swimming' more than just whale watching as more and more people are interested in swimming with the whales. "Herein is where the challenge lies," he added. Close to 15 million people all over the world now are involved in whale watching, with US$2.1 billion spent in the industry. 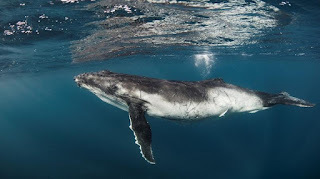 Over 13,000 jobs have been made available as a result with whale watching being described as "an industry that provides a new model for use of natural resources, an industry that relies on whales in a non-extractive way that when well-managed can be truly sustainable". "In some areas whale watching continues to show strong growth against overall tourism, with Iceland, for example," he said. About 17% of whale watching worldwide occurs in the Pacific islands, with most whales watching happening in North America (48%) with 38% in the United Stets of America alone. Mr Hoyt said whale watching in established areas is becoming more diverse, with new ways to go whale watching. "Yet at the same time whale watching is becoming more competitive," he said. He said that the numbers of boats and people on the water have put some populations in danger and diminished the tourist experience. "Sanctuaries have whale watching but whales also need sanctuaries from whale watching," he added. Mr Hoyt said that whale watching tourists want closer and closer encounters with whales, and operators are advertising and feel they need to offer closer and closer encounters. That, he added, poses a bigger challenge for all to see how best whales could be protected. Photo: Tourism Tonga Whale watching off the coast of Tonga.